Picture this, you open the USB your photographer gave you of your beautiful wedding day photos, only to discover most of your images are ruined by guests blocking the shot with their smart phones. This is the harsh reality of a world dominate by technology and social media. While these items play a pivotal role in our day-to-day lives, there is definitely a time and a place for their use – and it may not be your wedding. Asking your guests to leave their phones switched off during the ceremony is called an “unplugged wedding”. This prevents them from taking photos and ruining any professional shots. It also means they will not have any images to upload to social media before you get a chance. If you so wish, you can ask your guests to keep their phones off for the initial stages of your reception to get a perfect entry shot and first-dance snap. Following the formalities you may invite your guests to get picture happy with their phones, but still maintain they refrain from uploading images to social media. 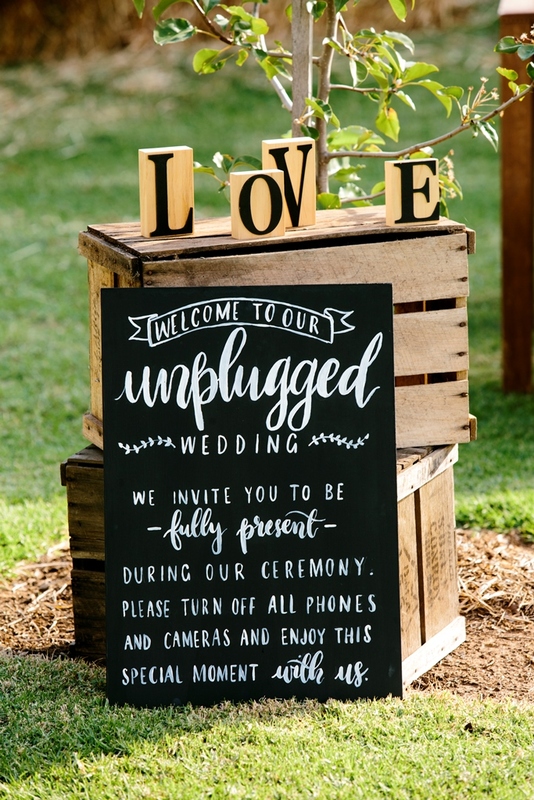 The best way to ask this of your guests is to pop a little note on your invite saying your wedding will be unplugged, backing this up with a sign at your ceremony and reception. Add an extra note, reassuring your guests you will share the pictures from the day when you have them and you are ready.